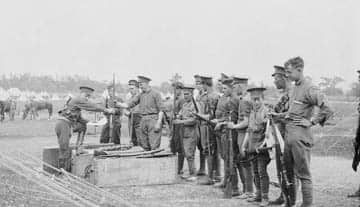 On the battlefields of the First World War, Canadian soldiers found themselves frantically trying to free jammed rifles in the face of an attack. The faulty rifles came to symbolize the greed of war as some Canadians made it rich by sacrificing the lives of soldiers for profit. From the beginning of the war, there had been complaints about the shoddy supplies given to Canadian soldiers. Their boots rotted in the mud, their uniforms disintegrated and their trenching shovels were utterly useless. Most troubling was the Ross rifle. The rifle was designed for great accuracy but tended to get jammed when exposed to the dust and the mud of the battlefield. Canon Frederick Scott was a Canadian army military chaplain in the war. "The Ross Rifle is the greatest crime ever perpetrated against the soldier boys and their loved ones. The blood of Canadians wasn't worth the filthy gold that somebody made out of it." Hughes was responsible for many of the munitions and equipment from Canada that ended up on the battlefields of Europe. He was head of the Imperial Munitions Board of Canada, created to coordinate a billion dollars worth of contracts. At its height, Canada wartime industry had more than 600 weapons factories making ammunition, aircraft, ships, vehicles, chemical products, gases and explosives, uniforms and boots for the war effort. The industry employed 150,000 workers, (40,000 of them women) and did $2 million of business daily. But the industry was scandal-ridden and inefficient. During Hughes' tenure, newspapers often published stories about the sudden fortunes made by his close allies, who received huge wartime contracts. Finally, public indignation ended up forcing Hughes to resign from Cabinet in November 1916. That summer the Ross rifle was withdrawn from service and Canadian troops were rearmed with a British-made rifle. Joseph Flavelle replaced Hughes as chief executive of the Imperial Munitions Board. Flavelle was a rich businessman whose slaughterhouse and bacon exporting business had helped earn Toronto its Hogtown label. In the fall of 1916, Flavelle sailed to France to view the war for himself. The Battle of the Somme had just ended and the battlefield was a sea of frozen mud and rotting bodies. It was an unforgettable sight for Flavelle. "My God! What have these poor men done? What have these men done that they must be punished in this way?" After visiting the front, Flavelle was a driven man. He immediately imposed strict profit margins and chastised manufacturers about poor quality and delays. "Profits! I come straight from the seat of a nation where they are sweating blood to win this war, and I stand before you stripped of many ideas. Profits! Send profits to the hell where they belong." 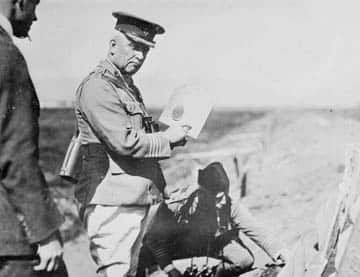 Under his leadership, Flavelle converted the scandal-ridden and inefficient wartime industry into a vast, well-organized operation. But profits soon became Joseph Flavelles worst nightmare. In 1917, Saturday Night magazine revealed that Flavelle had pocketed record profits himself by selling bacon to the English. "... the most sordid and despicable trafficking, namely the accumulation of great wealth out of the blood and agony of those who fight in the trenches and of their women and children who are now living scantily on the pittance of a soldiers pay," the article read. The accusations arose from the fact that Flavelle's pork trading business, the William Davies Company, had earned a profit of nearly 80 per cent in 1916 and again in 1917. Joseph Flavelle insisted he was innocent. A Royal Commission cleared Flavelle of all charges of unethical business practices but nonetheless he was branded a war profiteer in the public imagination. "Shall we close this chapter," said Flavelle. "It is all over except the unfortunate remembrance in every part of Canada that I am to be remembered after the war as a profiteer."